A grim reminder of past conflicts. The Ruined Kingdom is the twelfth kingdom visited in Super Mario Odyssey. The greater location of Crumbleden, the Ruined Kingdom is a stormy and mysterious world filled with the ruins of a long-dead kingdom. 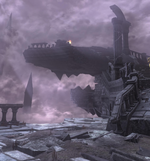 During the events of the game, Mario and Cappy crash land the Odyssey in this location after Bowser and the Ruined Dragon attack them. The crash leaves the Odyssey damaged, requiring three Power Moons to restore back to working condition. Mario fights and defeats the Ruined Dragon in this kingdom, enabling him to use the Odyssey again to leave and continue his journey to Bowser's Kingdom. The moon frames the tower...ominously. This tower once collected energy from lightning in the thunderclouds that constantly swirl here. 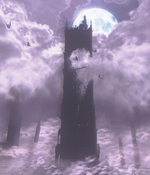 Some say it was destroyed by repeated lightning strikes, but others note the unnatural shapes into which the tower crumbled and wonder if it fell into ruin for different reasons entirely. Amid the ruins, these swords surely stand out. They're thought to be left over from a large battle here in Crumbleden. One certainly feels a sense of intentionality in the way they're stuck straight down, as if fallen from the sky. Some see them not as swords, but rather nails or stakes. Perhaps the eyelets at the top allowed ropes or chains through to anchor something, but it's impossible to say what. Are there clues to what happened here? It's only because of the people of Crumbleden's skill in construction that there are ruins left here to see. Their building style was reliable and straightforward, but whatever they'd hoped to accomplish by harnessing the fearsome power of lightning remains unclear. Some have theorized that the circular plaza atop the tower was built for a standoff of some kind. Doesn't it look like a creature of some kind? It's thought that this altar was built so this former kingdom could communicate with (or perhaps confront) something. This is the only altar built here, and scholars have been keen to discover its intent. It's also said to be shaped like something in particular. The idea that it was meant to charge lightning has been disproven. The new theory is that it was built to call something down and then restrain the lightning. There's got to be a logical explanation, right? The stone here has numerous large slashes cut through it, often in parallel tracks suggesting giant claws. But that can't be right—what could claw through stone? You'll see glowing spots scattered around on the ground. Engage in some amateur archelogy by giving them a hearty stomp! Visit the vast crumbling tower still standing watch over the area. Investigate the deep, clawlike marks in the stone. Admire the durable construction techniques of a once proud kingdom. Roulette Tower: An 8-bit area revolving around a castle tower featuring spinning lifts, where Mario must activate several P-Switches to stop the lifts in a way so that their pattern forms a staircase so he can advance. If Mario gets the lifts' pattern wrong, there is a Ground Pound Switch which he can press to make the lifts spin again so he can start over. 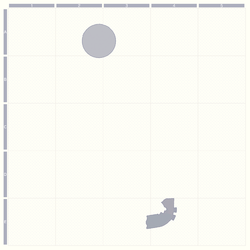 An arena-like area full of Chinchos where Mario must free a Chargin' Chuck from its cage and capture it to fight off the Chinchos and break open a cage containing a Power Moon. One of the Chinchos, when defeated, earns Mario another Power Moon. Battle with the Lord of Lightning! : The goal is to defeat the Ruined Dragon to proceed to Bowser's Kingdom. The Ruined Kingdom has yellow Power Moons. There are a total of 12 Power Moons (9 regular Power Moons and 1 Multi Moon) in Crumbleden. During the player's first visit to this kingdom, they can collect 3 Power Moons and the Multi Moon. After the player defeats Bowser in the Moon Kingdom, another Power Moon becomes available to collect. The Moon Rock will also be available to destroy, causing 5 additional Power Moons to be accessible. 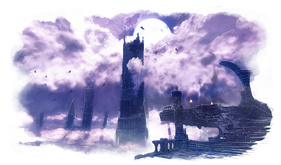 In order to repair the Odyssey and progress to the next kingdom, the player must collect 3 Power Moons. Horobia From 「滅びる」 horobiru, "to be ruined/destroyed." Spanish Vetustia From vetusto, meaning "ancient"
French Désoland From désolant (sad, desolating) and the English suffix "-land"
Italian Vetustia From vetusto, meaning "ancient"
This page was last edited on March 24, 2019, at 01:33.